Hang around creative people to fire up your photography! Share - Surround yourself with other creative people, and magic will happen! Inspire - Fijian fire dancer! Create - Want to start making $5000 in your photography? (00:41) Surround yourself with other creative people, and magic will happen! (03:35) The Fijian fire dancer! (06:04) Want to start making $5000 in your photography? (08:38) Earning money is the goal. Johny: Hey guys, what’s up? It’s Johny here and welcome to another episode of the SIC show. And I’m here with my main man B. How are you my Brother? Brent: I’m feeling fired up today. Johny: Fired up; this week on the show we’re going to share a little story about Fiji and how getting together without the creatives can get you over your creative hump. Brent: And Guys, I’m going to inspire you with a fire dancer from Fiji. And I’m going to tell you about my brand new course “From 0 to $5,000 in 8 Weeks”. Johny: Man, that’s epic. Let’s get into it. Surround yourself with other creative people, and magic will happen! Johny: Man, so Fiji; we’re back. Johny: Anyway, it was fun wasn’t it, Brother? Brent: We’re so good and I’m going to share, Guys an image from Fiji. It’s from workshop that I went to an amazing workshop in a tropical like paradise location. Johny: You can see in the image; absolutely blue, blue sky; islands everywhere, white sands and clear, clear water; just amazing. Brent: Yeah, but I think the best part was just hanging out with all these great photographers. Johny: Yeah, other creatives; awesome. Brent: Yeah, love it. So, as you can see in this image everyone from the workshop including the workshop crew because Johny and I were filming it. And Johny is wearing his “sunnies”. Johny: Yeah, because it was sunny. Brent: I wish these people could take their sunglasses off. Johny: Look at the picture, there are other people with “sunnies” as well. It wasn’t just me. I wasn’t the only offender. Johny: Yeah, so amazing location. You know, the one thing I love the most about being around with many creative people, Man, is just being inspired. The inspiration you get from being around and whether that’s inspiration for your photography or life or just being on great location and telling the stories of the day. I just love it. Brent: And I mean we had some great conversation. I did a couple of beers. I mean we all did and different aspects of photography and your philosophy when it comes to photography. I really enjoyed that. Tony here, he’s talked about the “Why”. So, why are you taking photos? And what do you want to create; and basically, the artist within you. So that was awesome, love it. And we will get Tony on the show soon. Johny: Yeah, Tony. We’re looking at you, Bro. So Guys, I supposed the take away is if you get a chance to hang out with creative minded people at any stage, you know. Take it because you never know what you’re going to come home. What you’ve learned and how you’ve grown with your own photography and as an artist. It’s absolutely an amazing experience. Brent: Yeah, especially if you’re feeling a little creatively drained. You’re not inspired to go out and take photos. You’ve got to level a plateau. You’re just not feeling it anymore. Brent: Go with other photographers, other creative people and you will feel it. Johny: You will; great, Man. Johny: Alright B man. 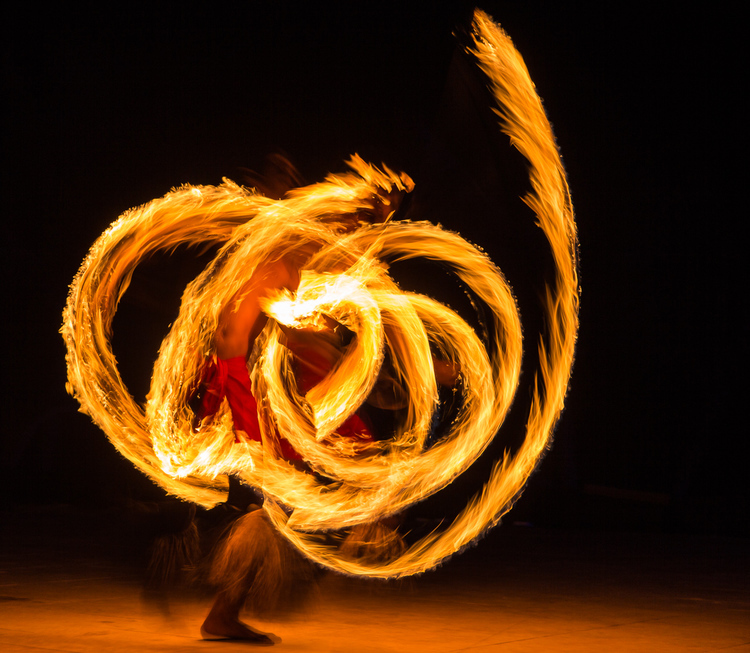 Inspire us with one of your amazing fire dancer images from Fiji. Johny: I think it’s kerosene. Brent: And the guy came close to me about you know, maybe twice the distance you’re away from me; maybe 2 and a half or 3 meters away. I could feel the heat from the flames. Brent: And I was sitting on the floor shooting this. So, here’s the image. I wanted to get a long exposure as long as I could but I didn’t bring my tripod. Johny: So, what did you there, Mate? How do you come about that? Brent: So, you sit down. You will not stand because you’re moving when you stand. I sat down, held my camera still as I could. Put the image stabilizer on my lens, and I shot this at a 1 second exposure. So, click, click. And just hopefully it’s sharp. And it is reasonably sharp because all the lights coming from the fire, basically. Brent: So, the fire is sharp and his body is kind of blurred. And it’s kind of lit up in certain areas. I can see his belly button over there and then one leg and another leg and a bit of the head moving around and everything. But it creates this amazing, so real, weird kind of fire shot. Johny: Yeah, it’s amazing. You know, I love the fact that a lot of the shots I’ve seen from a few of the other people that were there. The fire was often very blown out. And you know, obviously, it’s been over exposed, it isn’t too blown out. It’s great. I actually liked the movement of the guy. The movement of the guy actually adds to the whole image. It just adds the dramatic feel of moving fast, you know. And those lines, Man, just epic. Johny: I love them Man. And the gold in the ground too, you know that glow from the fire that the camera’s picked up there. It’s just amazing, Bro. Brent: Yeah, it’s awesome and Guys, this is one of the most challenging photo shoot I’ve ever been on because the light is constantly changing. So, if I remember right, I think it was set it on minus 1 exposure compensation, and then I set it to a time value of 1 second. So, I controlled the shutter speed. Brent: And I just let the aperture take care of itself. I think it was 100 ISO. Brent: Yes, shutter priority and I might’ve had it on auto ISO. I can’t quite remember. Johny: But the fact it came out at a 100 is pretty amazing. Brent: Because before they’re dancing the fire, I had it like 3200 ISO. Just trying to get the low light, you know from the building is kind of behind us. So, there it is these Guys, if you’re ever shooting fire, just experiment. Go to shutter priority and experiment as much as you can. Johny: And take a tripod. Brent: Tripod would be good. Johny: Yeah, a tripod, a timer and a shutter release. Yeah, definitely recommended but if you haven’t got that with you, Man, still amazing image. You’ve worked what you’ve had. Want to start making $5000 in your photography? Brent: Alright, Guys. In the Create section I’ve got something new to share with you. Something I’ve been working on. I’ve been creating in the last few weeks. And it’s my new “8 week - The Business of Photography” course and it’s for people that are just starting off. Photographers or great photographers who obviously know all their skills and they can take good images. Now they want to start making their money from their photography. They want to build a proper business out of their photography. Take it from a hobby to a business; so basically, from “0 to $5,000”, your first $5,000 in your photography. Johny: Wow, that’s exciting, Man. That’s really exciting; so in 8 weeks? Brent: So, I’ve taken my massive course. My “Portrait Photography for Profit” course which is 60 videos and quite a few hours of content which is kind of or it might be a little overwhelming for the beginner or a person just starting out. And I’ve reduced that down and I’ve also gone back to all the other beginner courses that I could get my hands on. And I’ve tried to simplify it or I am simplifying it to just the things you needed to know. So, you won’t get overwhelmed which a lot of people get. A lot of people jump into a course initially and there are so much to know and so many ways they can go that it’s just too much and they hit overwhelmed. Johny: Yeah, not only that. Sometimes you get a new course and you’re all excited. You get the first 10 videos done and the last 20 never get touched. Johny: They’re just forgotten. I mean, that’s the beauty about having an 8 week course, you know. The next 8 weeks I’m going to pay, I’m going to commit to this. I’m going to make it. Johny: So, how does the course work, Mate? Brent: So, you get 1 lesson per week and then 1 exercise book per week; so a couple of exercises that you can do. Some action steps that you can do. So, the first lesson is your mindset and the “Why”, why you’re actually in photography and why you’re doing it. Then I go through just the things you need to know. So I take it like my massive lesson that’s this big and I’ve reduced it to this big. Johny: Just the things you need to know. Brent: Just the things that you needed to know and just the things you need to do to achieve results. Brent: So basically, each week you get a lesson and action steps that you need to do. Plus, you can ask questions in my community. So, I’ve created a special community just for the business of photography. My Photo Profit community and you can ask questions from me in there. Johny: So basically, you get your hand held along the way for 8 weeks, and you’re there every step of the way. They get a lesson, they get an action step and at the end of 8 weeks, you’re going to be earning money. Brent: Earning money and that’s the goal. Brent: The goal is to basically just give you what you need, make you do or encourage you to just what you need to do, and you going to get results. Johny: That’s epic, Man; I love it. I love the fact that it’s bought by chunks, you’ve got a period of time that you know you have to commit to this thing. So, it’s not like, “We’ll get to it one day”, it’s not going to happen. You’ve got that 8 weeks, you’ve got the lessons, you’ve got an action steps you have to take every week that you’re committed to, plus Brent is there with you every step of the way to make sure that this happens. Not only to answer your questions and solve your problems but I’m sure it’s a bit of holding people accountable that they take those steps they need to do. Brent: I think that’s the key to this thing is having someone hold you accountable; basically, a coach. Brent: So, I’m the coach. I’m there to make sure you achieve what you want to achieve. Johny: Can I have a whistle? Brent: Maybe we’ll have one of these. Johny: Oh, a dinger. It’s been that long. We didn’t have dinger, Mate. Brent: So Guys, the action step now is to sign up to my pre-launch list. So basically, you’re going to sign up to tell me that you’re interested in jumping to this course. And I’m only going to take limited amount initially to get through the course and we’ll see how it goes and you know. Because I want that first group to really achieve results. Johny: That’s it. Make it happen, Man. Johny: So if you’re excited about that like I am, please sign up and links will be on the notes and get involved because it’s going to be huge, Mate. Johny: That’s exciting. I mean, I don’t know I other place that does the same thing is it? Brent: I’ve looked around and there’s nothing out there. Johny: So, you’re basically telling people in 8 weeks you’re going to go from $0 to making money and that’s incredible and you’re going to held a hand the whole way and buy those chunks. Brent: I’m going to show you how to make your first 5,000 in 8 weeks. Johny: Amazing, Man. Love it. Get involved Guys. Don’t let this opportunity missed. And like Brent said it’s very limited. So, share your interest now. Brent: Awesome, Guys. Yup, sign up. Johny: Awesome. Man, another epic show, Bro. Brent: Yeah, oh, what about my hat? Johny: I know. What about my no hat? Check out this haircut. Johny: I got the wet look today. Brent: Okay, there you go; so sleek in the back, right? Johny: To be honest Guys, the reason that I’m only wearing a hat is I never do my hair. So, this is a rare opportunity. I had my hair done. Brent: What do you think of my hair? I’m letting my hair done too. Johny: Yeah, anyway, exciting show Guys. So the tip on the show is Man, get out there with other creatives and get inspired. Go and find some fire dancers. Don’t do this at home because they are professionals. So, don’t try it at home. Brent: Yeah, and sign up for my new course. Johny: yeah, that’s the main thing, Man. Sign up for his exciting new 8 week course with Brent Mail holding your hand, business photography.